Betty Williams (May, 1943 - ) was a co-recipient, with Mairead Corrigan, of the Nobel Peace Prize in 1977 (the prize for 1976), for co-founding Community of Peace People, an organization dedicated to promoting a peaceful resolution to The Troubles in Northern Ireland. With Corrigan and their Peace People movement, which involved thousands of women from across the religious divide in Northern Ireland, she is credited with helping to create the climate that made the Anglo-Irish Agreement of November 1985, possible, representing the first breakthrough in peace negotiations since the start of the "Troubles," in 1969. She heads the Global Children's Foundation and is President of the World Centers of Compassion for Children International. She is also the Chair of Institute for Asian Democracy in Washington D.C. and a Distinguished Visiting Professor at Nova Southeastern University. Williams led a women's movement for peace that consisted of ordinary women from both sides of the divide. She, herself, had no political experience before she launched the initiative. Her achievements have been an inspiration to millions around the world, especially to women in situations of conflict who want to stop the killing and protect the lives of their children, husbands, and friends. Williams was raised as a Catholic. Growing up in Northern Ireland, the Catholic-Protestant divide impacted on almost every aspect of life. Since the establishment of Northern Ireland as a self governing province within the United Kingdom, the government had been dominated by Protestants who used their majority to discriminate against Catholics. The electoral system was rigged in favor of Protestants, as was the public housing system. Discrimination in the workplace was common place. Inspired by the Civil Rights movement in the United States, a civil rights movement began in Northern Ireland during 1966, led, among others, by the future Nobel Peace Prize winner, John Hume. The civil rights movement was non-violent. Others turned to direct action, and to organizations such as the Irish Republican Army, which joined in 1972, convinced that it was the only "group that would protect the Catholic community" (Buscher and Ling: 46). Williams "shared the deep frustration and anger that Catholics were feeling" (46). She lost two cousins that same year. She became disillusioned by violence and was for a short while a member of a peace group founded by a Protestant minister, Joseph Parker. Shortly after that, she underwent an experience that resulted in her starting what is widely known as the woman's movement for peace in Northern Ireland. "The voice of women," said Williams, "has a special role and a special soul-force in the struggle for a non-violent world" (Buscher and Ling: 87). She was drawn into the public arena after witnessing the death of three Catholic children on August 10, 1976, when they were hit by a car whose driver, a Provisional Irish Republican Army fugitive named Danny Lennon, was fatally shot by British authorities. Williams was driving in her car with one of her children when she heard gunfire. She turned the corner to her street and saw the three Maguire children and rushed to help. Their mother, Anne Maguire, who was with them, eventually committed suicide in 1980, after a failed attempt to start a new life in New Zealand. Within two days of the tragic event, she had obtained 6,000 signatures on a petition for peace and gained media attention. Together with Mairead Corrigan, Anne Maguire's sister, she co-founded the Women for Peace which later, with co-founder Ciaran McKeown became The Community for Peace People. The two organized a peace march to the graves of the children, which was attended by 10,000 Protestant and Catholic women—the peaceful march was disrupted by members of the Irish Republican Army, who accused them of being "dupes of the British." The following week, Williams and Corrigan again led a march—this time with 35,000 participants. On August 13, the day of the Maguire children's funeral, Betty Williams and Mairead Corrigan were to appear with journalist Ciaran McKeown, on a current affairs television program, and although they arrived too late, they met McKeown, who joined the two women in founding the Peace People. McKeown wrote the original Declaration and organized the rally supporting it. The first demonstration, on August 14, 1976, attracted 10,000 people, mostly women. Protestant participants (each group carried the name of their neighborhood on placards) encountered jostles and angry shouts from some IRA supporters in the crowd, shouting, "Brits Out! Provos Rule," but when the Catholic and Protestant groups met, they embraced while other protesters successfully drove off the IRA activists (53). Catholics later escorted Protestants back to their buses, to ensure "there was no more trouble from the … IRA." Other successful demonstrations followed, with Catholics and Protestants crossing boundaries into each other's zones, something that people did not do. At one rally, the Protestant leader of Women Together, Sadie Paterson, sang a hymn, churches rang their bells, and "people wept tears of joy" (57). With more signatures, more rallies, including Trafalgar Square, London, and their "Peace Declaration," the movement generated a ground swell of anti-violence sentiment. We recognize that to build such a society demands dedication, hard work, and courage. We recognize that every bullet fired and every exploding bomb make that work more difficult. We dedicate ourselves to working with our neighbors, near and far, day in and day out, to build that peaceful society in which the tragedies we have known are a bad memory and a continuing warning. The dramatic display of support for peace that the two women had organized led to their joint receipt of the Nobel Peace Prize in 1977 (the prize for 1976). That first week will always be remembered of course for something else besides the birth of the Peace People. For those most closely involved, the most powerful memory of that week was the death of a young republican and the deaths of three children struck by the dead man's car. A deep sense of frustration at the mindless stupidity of the continuing violence was already evident before the tragic events of that sunny afternoon of August 10, 1976. But the deaths of those four young people in one terrible moment of violence caused that frustration to explode, and create the possibility of a real peace movement… As far as we are concerned, every single death in the last eight years, and every death in every war that was ever fought represents life needlessly wasted, a mother's labor spurned.". The Peace People is a secular organization, but many of its supporters were deeply religious. Both women can be described as women of faith. In her Nobel Lecture, Williams spoke of being "for life and creation." Women, she said, had for too long encouraged men to go to war, believing it to be brave and manly. Now, women of the world needed to encourage men not to "turn up for war, not to work for a militarized world but a world of peace, a non-violent world." Women, she said, did have a special contribution to make, to ensure that "the realities of giving birth and love" get "pride of place over the vainglorious adventures that lead to war." She knew that priorities could not be changed overnight, but "men must begin to have the courage not even to prepare for war," and money spent on arms should be diverted to feed the hungry and house the homeless. Award of the Nobel Peace Prize recognized the impetus given by these women towards shaming the supporters of violence to trust politics instead. It is widely accepted that their campaign helped to create the climate in which the 1994 cease-fire became possible. At the time she received the Nobel Prize, Williams was working as a receptionist and raising the two children she had had with Ralph Williams. Her decision to retain the prize money led to a a rift with Corrigan, as they had agreed to contribute the money to the movement. The movement itself suffered as a result and actually struggled to raise contributions. The strain on both women impacted on their families and William's own marriage suffered. Her marriage "fell apart" in 1979, and by 1981, she was divorced. In 1982, she married James Perkins, and moved to the United States, where she toured and lectured extensively. Her Nobel Prize gave her a wider platform and she felt confident to continue her campaign for peace, intervening in Bosnia and elsewhere, working through the World Centers of Compassion for Children and the Mothers of the Earth for World Peace. In 1998, he founded the Global Children's Foundation, "a nonprofit group dedicated to helping children in crises around the world" (94). By 2005, the foundation had raised over a million dollars. 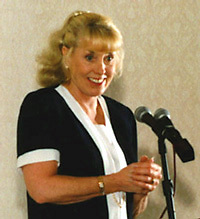 She spent time as a visiting professor at Sam Houston State University, in Huntsville, Texas, and in 2004, she returned to Belfast, Northern Ireland. Since winning the Nobel Peace Prize, Williams has received the People's Peace Prize of Norway in 1976, the Schweitzer Medallion for Courage, the Martin Luther King, Jr. Award, the Eleanor Roosevelt Award in 1984, and the Frank Foundation Child Care International Oliver Award. In 1995, she was awarded the Rotary Club International Paul Harris Fellowship and the Together for Peace Building Award. On July 24, 2006, while delivering a speech at the Earth Dialogue forums, Williams told school children at the Brisbane City Hall shortly after visiting Iraq, "I have a very hard time with this word 'non-violence,' because I don't believe that I am non-violent." She went on to say, "Right now, I would love to kill George Bush," blaming him for the deaths of children, particularly in the Middle East. "I don't know how I ever got a Nobel Peace Prize, because when I see children die the anger in me is just beyond belief. It's our duty as human beings, whatever age we are, to become the protectors of human life." ↑ Peace People, Declaration. Retrieved December 5, 2007. ↑ Betty Williams, Nobel Lecture. Retrieved June 13, 2007. ↑ Annabelle McDonald, Peace Prize Winner could 'kill Bush.' Retrieved June 13, 2007. Nobel Committee information on 1976 Peace Laureates. This page was last modified on 15 December 2016, at 16:25.